A 741 op-amp is is configured as an oscillator in this circuit and used to flash an LED on and off. This is another easy circuit for beginners in electronics and can be built on an electronic breadboard. The oscillator part of the circuit consists of 4 resistors, 1 capacitor and an LM741 op-amp IC. The fifth resistor (R5) is a current limiting resistor for the LED. In the circuit diagram below, the circuit is powered from 9V. 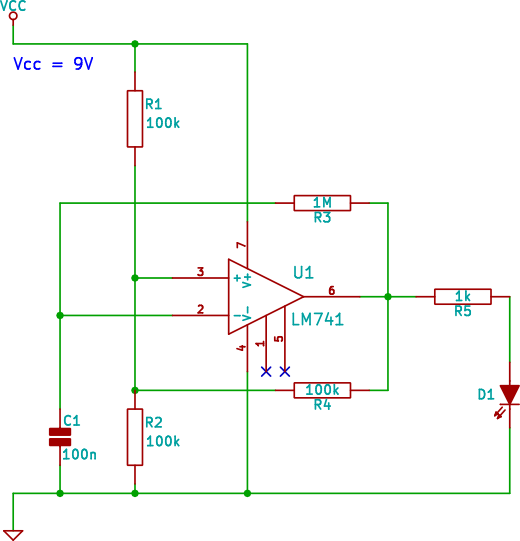 This circuit should be able to operate over a range of voltages from 5V to 12V. The video below shows the circuit built on breadboard.